Four weeks after Bolton midfielder Fabrice Muamba suffered a cardiac arrest during his team's FA Cup quarter-final at Tottenham , Livorno on loan midfielder Piermario Morosini died in hospital after suffering a cardiac arrest during his team's Serie B match at Pescara. The 25-year-old collapsed in the 31st minute and received treatment on the pitch - reportedly including a heart massage in a bid to resuscitate him - before being rushed to hospital. The match was abandoned and the players left the field in tears. Lega Serie B then confirmed on their website: 'Tragedy on the field. 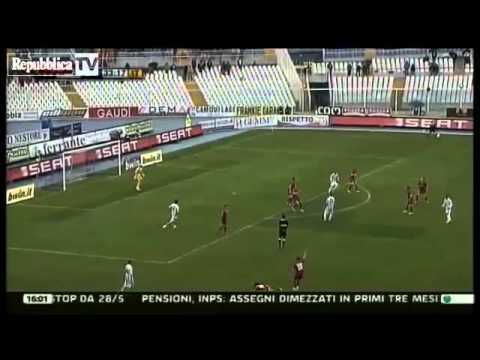 After suffering a cardiac arrest during the match between Pescara and Livorno, Piermario Morosini has died. The Lega Serie A also said in a statement on their website: 'The football world mourns the tragedy that occurred this afternoon in Pescara, where during the game between the hosts and Livorno, the player Piermario Morosini slumped to the ground suffering from a heart attack. 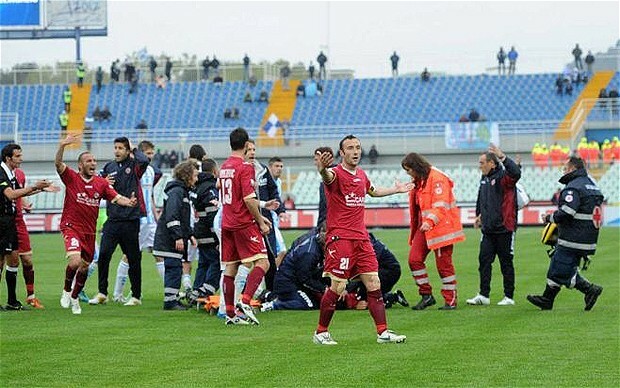 The ambulance came onto the field in Pescara to take Morosini away, with both sets of players standing by in distress. 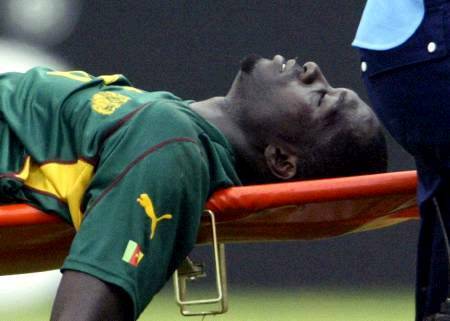 No one will forget Cameroon international Marc-Vivien Foe, who collapsed during a Confederations Cup semi-final against Colombia in 2003 and died in hospital and There have been two similar tragedies with players suffering heart attacks on the pitch in Spain in recent years - Sevilla's Antonio Puerta in 2007 and Espanyol's Dani Jarque in 2009 - while Motherwell's Phil O'Donnell died after suffering a cardiac arrest against Dundee United in 2007. Bergamo-born midfielder Morosini started his career in the youth ranks at his hometown club Atalanta before moving to Udinese in 2005. A loan spell with Bologna followed before a 2007 switch to Vicenza, where he stayed until returning to Udine two years later. He had further loan stints with Reggina, Padova, Vicenza and finally Livorno.